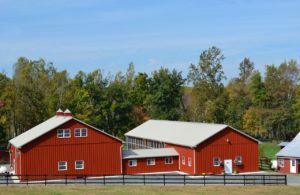 Have your event on a working farm! Perfect for your rustic wedding, corporate event, reunion, farm-to-table dinner, anniversary, fundraiser, conference, birthday party or retreat. Create an unforgettable event with an outdoor wedding ceremony, outdoor games, moon bounce, photo booth, farm walks, farm tours and our on-farm country store. Events up to 150 people. Suite for bridal party available. Manor house for wedding-related events up to 40 people.